Whilst walking around a woodland this morning trying to photograph butterflies (I’ve used the word ‘trying’ for a reason as it was a very unsuccesful trip!!!) I entered a shadowed area of the woodland where tiny rays of light were filtering through the canopy. As I walked through, I came across a spider web that was glinting in these rays. Thinking to myself that would make a nice photograph but thinking the lighting was nowhere near enough good for photography I nearly continued on my journey. Luckily, I like a challenge and thought that the butterflies were not playing ball so decided to have a go! If you can imagine this web was the size of a jam jar lid and the spider was about 5mm long! (I’d missed the spider at first as it was so small). This web was moving up and down at about 20mm range and backwards and forwards so I didnt think at all that any of these images would come out sharp. Anyway, I perservered and I’m glad I did. Due to the low light I had to boost the ISO up to 2000 and because I wanted a fairly fast shutter speed I decided to use a large aperture of f/3.5 giving me a resulting shutter speed of 1/200 sec. Due to the background being so dark, I knew from experience that the camera would expose off this, instead of the 5% of the frame that the spider occupied. If I had photographed this at 0 compensation the image would have been completely over exposed as the camera would have metered for the background resulting in a very slow shutter speed giving me a glowing bright white spider and web. Instinct took over and I knew that I had to reduce the exposure compensation by at least -2. 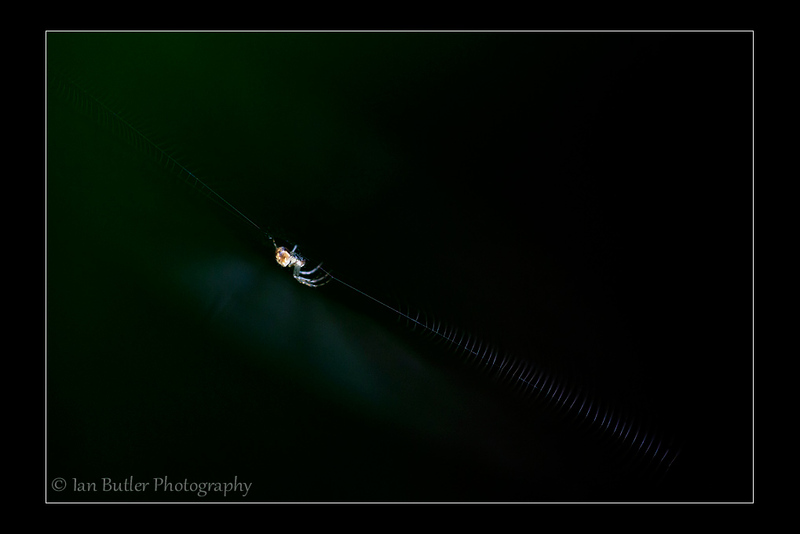 Trial shots resulted in me dialing in – 2 1/3 compensation to get a correct exposure on the spider and web, plunging the background into darkness. This image is better viewed larger so please click on the image. Canon 5d MK3 and Sigma 150mm f/2.8 macro lens.